The human body cannot naturally make the omega-3 fatty acids which are commonly found in fish. 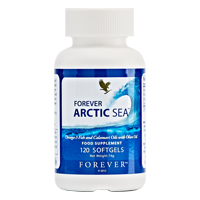 Forever Arctic Sea’s blend of natural fish, calamari and oleic olive oil contains the perfect balance of essential fatty acids EPA – which contributes to the normal function of the heart – and DHA – which contributes to the maintenance of normal brain function. Take 2 softgels with meals three times daily with water. Natural fish oil, gelling agent (gelatin), humectant (glycerin), water, calamari oil (mollusc), olive oil, natural lemon oil, natural lime oil, antioxidant (d-alpha-tocopherol). Allergy advice: for allergens, see ingredients in bold.